yesterday SP (sweet patootie) and I went to see this fella about our money. He is a mortgage guy - SP drug his heels a bit feeling like Eeyore that our destiny was sealed but my eldest son had told me great things about this fella who is from Newfoundland and so off we trotted. And lo and behold, if all things come about as planned, the guy has turned into Mighty Mouse in my mind. 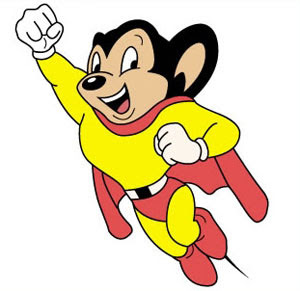 Do you all remember Mighty Mouse? I have him slightly confused with Roger Ramjet (remember him?) probably because the plots were similar. A girl mouse with golden curls (odd I know) would be trying to get enough money together to pay off the dastardly Dan with the curly mustachio who held the mortgage on their little mouse farm. And somehow he would end up tying her to a train track - I'm afraid my memory is a little rusty here because I'm not exactly sure how that would get him his money but I think it was a cartoon metaphor for her giving him her precious virginity or something - and then Mighty Mouse or Roger Ramjet would fly in and save her at the last moment. Well Dave - the mortgage guy - did that. And all with a pencil and a scrap piece of paper. He wiggled this around and tightened that and said this and chuckled and hummed and voila! If he gets the money lender on hand (and he has a percentage of doing this which outstrips the competition by about 70%) we will be staying here and renting above and be able to eat too. I cannot adequately express my relief in words. Today I am going to get through a chunk of the novel - I think I can get to page 150 of the rewrite. That is my goal. Maybe more. We'll see. I'm also going to plant some vegetable seedlings I bought yesterday before we went to see the fella as an act of faith plus some annuals for the pots in front of the house which I am unsure of how to keep the voracious chickens out of. Did I tell you they ate my rhubarb down to the ground? And I thought rhubarb leaves were poisonous. Not to chickens apparently. Two more weeks or less for the clutch to hatch. Hopefully it will work out - there is another bigger dog kennel to get in town but I haven't gotten to it yet. Tomorrow or the next day perhaps. Actually not tomorrow as that is my last day of taking care of Sawyer. Next year he goes to school. boo hoo!